So that's us half way through the midweek Premiership fixtures. Let's hope for a few more goals tomorrow night when there are three more. The big one is at Pittodrie as second-top Aberdeen host reigning champions and leaders Celtic. A battered and bruised Rangers entertain Kilmarnock, while Dundee host the side that are on a high after knocking the Ibrox side out of the League Cup - Motherwell. Join us tomorrow for more live coverage. You can read Tom English's view of Hibs' win over Hearts in the Edinburgh derby. Hibernian win the first Edinburgh derby of the season after a stunning Simon Murray effort leaves Hearts floored at Easter Road. Alasdair Lamont was our man at New Douglas Park and here's his report of another goalless stalemate. Here's Brian McLaughlin's impression of the draw at McDiarmid Park. St Johnstone and Ross County draw a blank in the Scottish Premiership, though both sides are denied by fine goalkeeping. Andrew Southwick saw Scotland record a second successive World Cup qualifying win and here's his view of the game in Paisley. Hamilton Academical manager Martin Canning also felt his side should have had been awarded a penalty, citing challenges on Greg Docherty and Antonio Rojano. "I thought both of them were penalties," he said. "I haven't seen them back yet, but I thought the pull on Greg Docherty, he just pulled him straight to the ground. "And the second one with Rojano, he gives a free-kick on the edge. It looked like it was in the box to me. "I haven't seen [Partick Thistle's penalty claim] back yet either, whether it was or whether it wasn't. "That's football. Sometimes you get them, sometimes you don't and tonight neither of us have got anything." Ross County manager Owen Coyle was pleased with the point against St Johnstone. "I thought we played a lot of good football and created a lot of good chances," he told BBC Scotland. "At times, we had to stand up to some balls into our box and we had to stand up to that. "A draw was probably fair. "It is seven points from four games and that's a good return and we're going in the right direction." The downside for Coyle was a thigh injury that forced off goalkeeper Scott Fox. "It is a tear in his quad and the worst case scenario is six to eight weeks," he said. Scotland Women head coach Shelley Kerr says it is still early days for her side as her side made it two wins from two in their World Cup qualifying group. She told BBC Scotland: "It's a start. We're not getting carried away. "In the first half, I don't think we played particularly well, but that's the demands we put on them. "We scored some really good goals and we certainly used the wide areas well. "We've not had a lot of time with the players, so to implement our strategy and the way we want to play is going to take time." Hearts head coach Craig Levein admitted that his patchwork side were well beaten. "It was very bitty and we did not get going at all," he told BBC Scotland. "We did not do ourselves justice - as we were not willing to bring the ball down and make passes. "I will be grateful to get a few players back from injury and that will help us. "We had a couple of players out of position, but that is no excuse. "We had plenty of effort, but I would have liked us to do more in possession and that was the biggest disappointment." Partick Thistle manager Alan Archibald was left mystified why a shot from Ryan Edwards that was bloked by Dougie Imrie did not result in a penalty. "He blocked it with his hands like a goalkeeper," he told BBC Scotland. Archibald also questioned the decision to hand the game to referee Steven McLean so soon after a controversial League Cup semi-final between Motherwell and Rangers. The Thistle boss though McLean was scared to make a decision. "But I am delighted with the clean sheet as it's the first one in the league," he added. "I think Hamilton only had the one chance and I'm delighted with the boys at the back." Hibs head coach Neil Lennon described it as an excellent night for his side. "I think happy is an understatement," he told BBC Scotland after the 1-0 win over Hearts. I thought we were exceptional and that's as good a performance as I've had here. "They've got what they deserved and that level of performance was excellent. "I would have liked the scoreline to be a bit more comfortable." St Johnstone manager Tommy Wright was pleased just to have ended a run of three straight defeats. 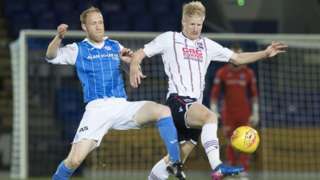 "We're not having many breaks in front of goal and that was evident tonight," he told BBC Scotland after the 0-0 draw with Ross County. "I have to be pleased with the clean sheets. "15 points from 11 games is a satisfactory start. "With a bit more composure, we should have won the game." Wright explained that Joe Shaughnessy was handed the captaincy despite Steven Anderson's return from injury because he wanted to take some of the pressure off the veteran defender. "By his admission, he hasn't been at his best this season and I thought that was one of his best performances of the season," he added. Saints ended the game the stronger, but it is now over six hours - and four successive blanks - for Saints in the Premiership. The point does move Tommy Wright's side above Hearts, but they remain in sixth place because Hibs leapfrog them both after that Edinburgh derby win. 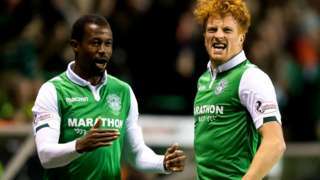 Simon Murray's early goal gives Hibs victory in the first Edinburgh derby of the season. But it was much more convincing than the scoreline suggests. It was a dull affair in Hamilton, but at least both sides can take some positives out of the game. For Accies, the draw not only keeps them above their visitors in the Premiership table but ends a run of six straight defeats. Thistle's point lifts them off the bottom of the table, a point above Kilmarnock, although the Ayrshire outfit have two games in hand. Oli Shaw comes on for Martin Boyle as Hibs waste time with a substitution and we are into two minutes of stoppage time. At 16, Harry Cochrane hasn't been a professional long, but that's a professional foul as he cynically takes out John McGinn and is rightly booked.